When I first started reading about Avios and points I knew that I had to have more means of collecting them. Only by travelling it will be very hard to do so, especially because I am price conscious and sticking to one loyalty programme can be very expensive.There are many credit cards out there, but as Muslims we have to be very careful how and what we use. Any card can be damaging if we use it in the wrong way, even our debits. We do not want to get involved with interest because as Muslims we know Islam prohibits this. And if we have a credit card we ALWAYS have to pay it off in FULL each month. It is very easy to get carried away and end up with bad debt. I certainly do not want this to happen to you or me. Don’t get me wrong credit cards are not all bad, they provide payment protection and I recommend you use a credit card when you buy something over £100. It is how we use the cards that can turn them into bad debt chasing us in this life and next. When I started reading I got really disappointed, because as a Muslim I wanted to take advantage of what the travel world offers without getting into cards. Then I found out about the American express Gold charge card. This is not a credit card and you do not have a limit, you MUST pay every month in full and you do not get charge interest. It is free for the first year to use and has other great perks too, such as insurance, payment protection, travel insurance, double bonuses for daily essentials and more. American Express has been around for very long time and has excellent reputation and customer service. After reading for hours on blogs, small print and reviews I decided this card is an excellent offer. 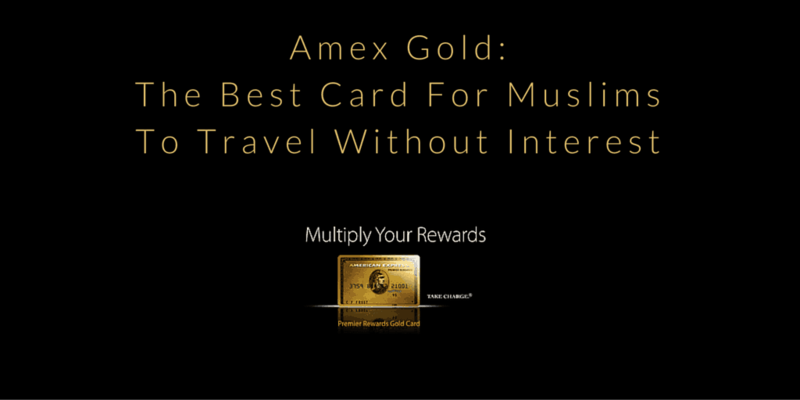 I find this card to be excellent value and for Muslims who do not want to get involved with interest this is a great card. There is no fee, no interest just use it as a debit card, pay it in FULL every month and you can travel the world in style. You can cancel anytime you want before your one year subscription runs out. To find more information about this card here. The sign up bonus is 20.000 points but if I refer you will receive 22.000 points (well worth it). If you want me to refer you please email me or comment below and I will be very happy to do so. I would like to apply for amex card but before that i would like to know, if there will be interest or subscription charge after one year of use. there is a charge after a year of £140, however you can cancel before the year ends. I am located in Singapore, are you able to refer me for the Amex Gold Card so I can enjoy the 22,000 points? this is my first Amex Card. Unfortunately, I can only refer for the card in the UK 🙁 Sorry about this. Just go ahead and get it in Singapore. Make sure they have the same terms and benefits beforehand. If I cancel this card within my first 12 months will I be able to avail their advantage points or get it transferred to avios? Salams Naveed, Before you cancel your card just transfer the points out of your account and then cancel. Transferring shouldn’t take more than few days. Assalaamu alaykum sister, I wanted some specific travel advice which I’m sure you can assist with In’shaa’Allah. Please could you kindly email me. Jazaak Allahu Khayran. Salams, with a debit card your cash is not protected. If something happens your bank is hardly going to be cooperative to return the cash. With credit cards, you have a limit and also by law you have money protections in place. Using a credit card or even a recharge card is so much better than a debit card. Today many hotels and rental places also want to secure the rooms / cars with credit card as with debit you cant “block” an amount. you have to remove the cash which is much more hassle. I would like to know , if after the first year of having the Amex card I decided to keep it for a second year , is the £140 charge interest? No, it is not interest, it is a service charge more like for the insurance for example or the benefits you receive. How can i apply for Amex card being citizen of India. Can you please give the full details. you will need to be a UK permanent resident or living in the UK. If you are based in India you can apply for the Amex India directly. Would you be able to recommend and I could still benefit from the 2000 extract bonus miles if I’m living in US? I managed to get £250 off Flights for 2 people for Umrah which included a stop over in Dubai too using Emirates, but you have to book using Amex Travel it came out to around £40 more expensive for 2 people compared to other Flight Comparison sight but with a lot of points accumulated it was worth it and also not to mention at the time i was booking Amex had a further £50 off if you spent £200 on flights! Highly recommended but important you don’t fall into accumulating interest! I am very happy that you managed a good saving Sajid. Definitely worth it if you can stay focused and avoid the interest. Well done.